It’s Saturday morning and folks are shaking the rain from their coats, stomping the snow from their boots, or wiping the sweat from their brow after making their way through the elements to get to the Goshen Farmers Market. Music plays throughout the long hall of this revitalized building as people shop, talk with friends, or zip through after devouring a croissant from Rachel’s Bread next door. The year-round market reflects the visible presence of a town that is active, diverse, and full of flavor. 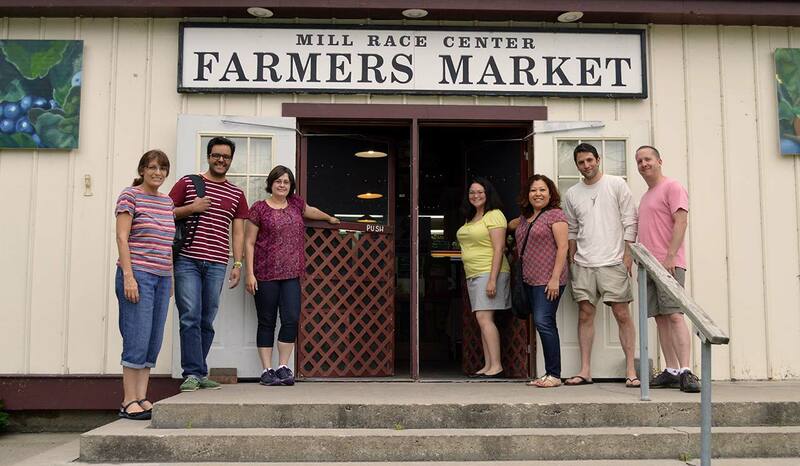 The Goshen Farmers Market, situated between downtown Goshen and the Millrace Trail, remains a thriving community gathering place after recently celebrating its 15th anniversary. Located at the old Millrace Center, the building was purchased for renovations by Dave Pottinger in 2000. Seeing the beauty in its age, Pottinger maintained the existing infrastructure, and later that year the Goshen Farmers Market was formed by the Community Sustainability Project. Since its formation, the market has served as a hub for entrepreneurship and creativity, given the local guilds that surround the building. Artists, musicians, and small business owners have found a market within this humming social space. In addition, the market has been committed to providing local, nutritious food for all in the community through it’s community supported agriculture (CSA) program, and Share the Bounty program. For the past two years, Goshen Farmers Market’s Share the Bounty Program has provided Elkhart County Clubhouse with a full CSA share for group meals and individual members at Clubhouse. “This proved to be a great way to introduce members to the Farmers Market, offer a meaningful Tuesday afternoon grocery shopping experience, and help members who otherwise don’t have affordable access to local produce,” said Rebecca Yoder, Clubhouse staff. In another unique partnership with Maple City Health Care Center and Vista Community Health Center, the market helps distribute over 50 vouchers to low-income patients in need of access to healthy foods. During the summer, dietitians from the clinics host weekly meetings with patients to show them around the market, and help them choose the right foods for their diet. “Our group trips to the market make for important hands-on opportunities where nutritionists and patients talk together about delicious ways to address common health concerns, like diabetes and childhood obesity,” said nutritionist, Ingrid Moser. This sense of cooperation manifests itself in relationships between vendors at the market as well. 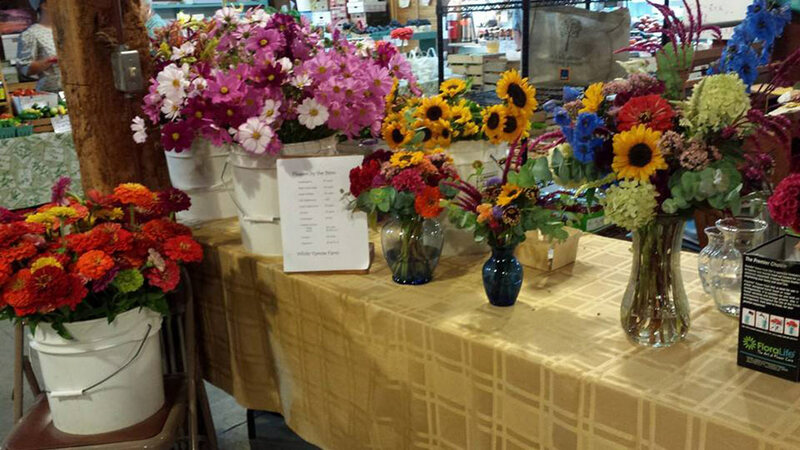 Phoebe Brubaker, freelance floral designer at Flowers by Phoebe, established a booth at the Goshen Farmers Market last year to serve as a central pickup location for her flower CSA. Brubaker described her relationship with the market as “symbiotic.” The market provides a space for her to commiserate and share with other vendors, and in addition she helps connect her customer base to the other local businesses. “It feels like a community here,” she said. The Goshen Farmers Market plays a vital role in cultivating the common good in Goshen by encouraging the community to engage with the local farmers, and artists that continue to make Goshen a vibrant place to live and work.